Stills for private and commercial use from Destillatio.de. Fast delivery from our own warehouse. Are you looking for a still? In this category you can find commercial "Al-Ambik®" und "CopperGarden®" stills with boilers from 75 liters. Please note that our standard stills and prices are listed here, but we can forge almost every other still. 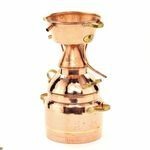 We often have certain stills up to 300 liters ready for shipment directly from our warehouse or we can offer display pieces at a reduced price. Please keep in mind that most of the large stills in this category can be individually forged for you, in most cases after receipt of payment. The delivery time for a large still is up to 8 weeks, depending on order situation and workload of our forge. If you are in a hurry, we are sure to find the right still for your needs in our warehouse in Germany. We are always happy to greet visitors in our display rooms and museum, where you can see the differences between the various stills. Order your still with Destillatio today!